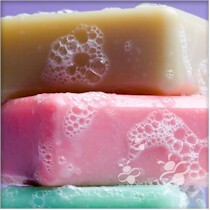 Soap (or Detergent) is very important to the proper operation of your washing appliances. The newer front load clothes washers use much less water, and so they need much less soap - about 1/3 of what you would normally use. If you use too much, it won't rinse out of your clothes, and the extra suds could cause drain problems and other errors in your washer. Always use the proper High Efficiency Detergent as recommended by your owners manual. And try to leave the washer door ajar between uses. Doing this, along with wiping out the rubber bellows after a wash will keep your front load washer smelling fresh. Your dishwasher needs the proper detergent as well. Never use liquid dish soap, as it causes too much sudsing. This can cause overflowing, a big mess, as well as floor damage. Liquid dishwasher detergent works well, and avoids possible build-up that can happen with powdered detergents. For the best operation of your dishwasher, be sure to run hot water to the sink faucet. This helps ensure that the water entering your dishwasher is already hot, and provides for the best cleaning. Also, if you have hard water, running an empty load on occasion with a cup of white vinegar, or a commercial product such as Glisten, Lemi-Shine, or Dishwasher Magic, can help to keep mineral build up from occuring. But be sure to run the dishwasher empty, because the acidity of these products can etch your dishes. 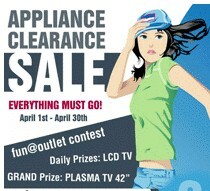 If you're having problems with your appliance, should you repair it or buy a new one? The most economical option may be either one, depending upon several factors. First, be aware that many times what seems like a dead machine may actually only require a simple fix. There are many safety devices that will cause your appliance to 'give up,' yet are easily repairable. Remember, you must weigh the cost of the repair versus the cost of buying a new machine. When thinking about a repair, you should consider the age of the appliance, how dependable it has been up 'til now, and what the repair may cost. Many older models are inexpensive to repair and will last for years longer than some of the recent models. The saying "They Don't Make 'Em Like They Used To!" is definitely true. When thinking about buying new, you should consider the price, warranty, delivery, installation and disposal costs, as well as the expected reliability of the new machine. Also, with the newer appliances, simpler is often better. Be sure to look at the less expensive models, even brand names with which you may not be familiar. Many of the best known appliance manufacturers sell lesser known names that have the same basic design as their better known counterparts.. The lower end appliances often have mechanical timers versus LED read-outs, and so are often cheaper to repair. They are also easier to diagnose, and the initial price is lower. Often, buying the high end model with the computerized gadgetry just add dollars to the cost, and features that you will not use. Your appliance repairman can advise you on the best way to go, and will certainly tell you when something is not worth fixing. Appliances certainly make our lives easier, allowing us more time to spend with our families, and doing the tedious chores better than we could by hand. There is a cost to this, however. Appliances bring high voltage, flamable gas, and running water into our homes in ways that are not always easily managed. The first rule to managing this risk is to respect the machinery. If you have no experience repairing an appliance, then you should not attempt it. Microwaves, for example, have extremely high voltage, upwards of 5000 volts, inside the cabinet. On average, 6 repairmen die every year from mistakes made repairing microwave ovens. Your electric dryer and oven run on 220 volts, a level that can kill or injure with ease. Please be careful, and ask for expert advice. The National Fire Protection Association has appliances in several of the top 10 causes of house fires in the U.S. Number one is leaving your stove or oven unattended while cooking. Number 3 is improper or poorly maintained heating equipment including space heaters and furnaces. Fireplaces follow at number 4. Number 5 is washers and dryers. 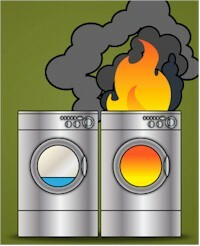 Many people never do maintenance on their dryer, leaving flammable lint to build up until it ignites. Proper maintenance is essential to keep your appliances (and your home) happy and healthy. Another danger is water. Most of your appliances that use water are hooked up to the plumbing full time. If a leak occurs, there is nothing to prevent the water from flooding into your home. To prevent this, it is wise to use stainless steel braided hoses in your water supply lines in your dishwasher, clothes washer, and refrigerator. You can also use copper tubing for your dishwasher and icemaker. Either way, these will cut down of wear of the hoses, or in certain cases, damage done by rodents. When using copper tubing, be sure to leave an extra coil or two to prevent tension or kinking of the tubing that may lead to leaks. It is also a good idea to turn off your water supply lines when leaving for any extended period of time. And always resist the temptation to leave the house when your appliances are in operation.